It was the first Smackdown of 2016 and the first broadcast on the show's new American home, USA and WWE took the opportunity to focus on two different titles. In the main event, Kevin Owens got a shot a Dean Ambrose's Intercontinental Championship, whilst earlier in the show, Charlotte put her Diva's Championship on the line against former friend Becky Lynch. With two promising bouts advertised, could Smackdown deliver and start 2016 with a bang?! For the shows debut on the USA Network, WWE bought in 12 time WWE World Heavyweight Champion, John Cena to lend the show some extra fire power. However, Cena didn't wrestle, as he simply accepted that Alberto Del Rio didn't want to wrestle him and called out Kalisto instead. The back and forth between Cena and Del Rio didn't quite hit the spot, as things seemed a little aimless and meandered about without a real purpose. I'm not quite sure it made much sense that Cena had Kalisto standing in gorilla, just in case Del Rio refused his challenge, but the crowd seemed happy enough with the replacement, even if they were much more vocal about a potential bout from Cena. Other highlights included Del Rio accidentally saying "Are you out of my mind?" and Cena saying repeatedly saying "Kalisto" and then dancing along to the Lucha chants. The crowd was pretty hyped for the opener, with the United States Champion getting a decent amount of heat, whilst antagonising the crowd throughout. The action was decent throughout with a vicious Del Rio controlling most of the match, however this did mean that we didn't get to see a whole lot of Kalisto's flashy offence, but with Del Rio have the crowd already in hand it wasn't missed too much. WWE seems to be high on the former NXT Tag Team Champion, and it wasn't too much of a surprise to see him pulling out a flash pin victory following a hurricanrana, after Del Rio was distracted by Cena at ringside. With Cena now out injured, a feud between Del Rio and Kalisto seems to be on the card, I definitely wouldn't mind these two go at it again. After watching this I get the feeling that these two have the potentially to put on a memorable effort on PPV, if given a little more time and space than they were afforded here. Miz TV was up next, with The Miz "scheduled" to look forward at 2016, but that wasn't to be as The New Day, Dolph Ziggler, Goldust, Neville and R-Truth all turned up to have their say. It was pretty run of the mill pre-Royal Rumble segment with everyone arguing about why they were going to win the Rumble. Obviously it got pretty boring pretty quickly as anyone who's watched WWE in the last twelve months knows how unlikely any of these 8 guys are to win the World Heavyweight Championship on the 23rd January. What did make this entertaining however was R-Truth's performance. His comedy character believed he was answering Alberto Del Rio's Open Challenge, Truth's vocals and facials when finding out that wasn't the case were spot on. Everyone else's reactions were also a change from the norm, with Xavier Woods pulling up a chair and beginning to eat popcorn as Miz and Truth argued back and forth. Things breaking into a brawl saw a return to the regular schtick. R-Truth, Neville, Goldust & Dolph Ziggler then teamed to take on The New Day and The Miz in a throwaway eight man tag team bout. There was enough talent in the ring to take the opportunity and put on a belter of a contest, but unfortunately all eight guys seemed pretty content to churn out a match and get out of there. This perhaps wasn't helped by a lethargic crowd, who had no real reason to care. Neville worked well as the Geordie in peril, but I'd have picked him out of the four babyfaces perform the hot tag, with Goldust slotting into the other role. 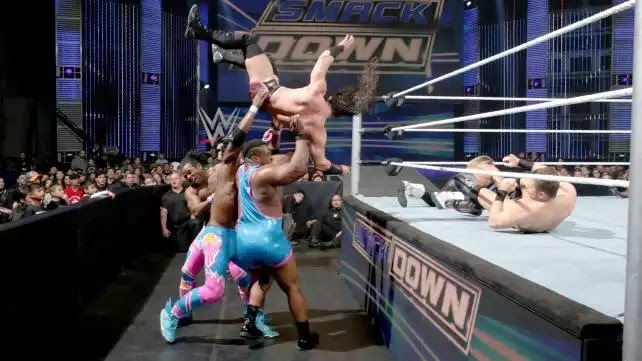 The closing sequence was the highlight of proceedings with Neville able to take out all of the New Day with a suicide dive, before Goldust and R-Truth set up Miz for a Superkick from Ziggler to give the good guys the win. I thought that Charlotte (with Ric Flair) and Becky Lynch put on a quality television bout here, that made each girl look like a star, whilst elevating the Divas Championship. The narrative of two former best friends is a simple one, but it's also easily relate-able and the two women used that well in the early parts of the bout, adding a little extra bite to the technical wrestling we've seen the pairs previous matches. Charlotte using her Dad to take control of the clash, by repeatedly rolling out of the ring and keep Flair in between the two, drove the bout forward well, working as a nice turning point for the middle of the contest. Whilst things got a little sloppy and rushed in final third, I thought the closing sequence, and especially Becky's near falls, was top class and having the call back to their bout on Monday Night RAW in November, with Flair distracting Becky, was the icing on the cake. Whilst they seemed reluctant at first, the crowd looked to be heavily invested in proceedings by the finish of things. With Charlotte retaining her title with her feet on the ropes, and Becky arguably having the match won if it wasn't for The Nature Boy, this feud is set up perfectly for a rematch at the Royal Rumble. As television main events go, this was a high quality contest. In a fairly even bout, Owens and Ambrose showed they have heaps of chemistry, producing a series of wonderful reversals that go better and quicker as the match went on. A section that saw Owens hit a German Suplex and Ambrose hit a Tornado DDT after both attempting a number of other moves was particularly satisfying, as was the earlier brawl on the outside that saw Ambrose hit a Russian Leg Sweep into the barricade. It was a shame that we didn't get a clear finish, but this is TV and having the two brawling around the arena to a double countout made perfect sense to intensify their rivalry and build to a big match on a Royal Rumble show where the two could have a lot more time (especially with Rumble now being for the World Title) The commentators (especially newbie Raunallo) putting over just how important the Intercontinental Championship was to these men made me a very happy chappy indeed. In comparison to TNA's debut on POP TV two days earlier, Smackdown's debut on USA was a massive success. Both advertised matches delivered what I was expecting of them, being good quality television wrestling matches, that held my attention throughout and made me want to see more from everyone involved. Whilst a title change would have made the broadcast feel a little more important, I don't think it was the be all and end all here. The show was hurt by a bit too much filler in the form of Miz TV and the Eight Man Tag Team bout and having two recaps of Sheamus vs. Roman Reigns from RAW was unnecessary especially the one that aired at the beginning of the show. This was still a decent outing for the blue show, establishing itself well to new viewers on USA. I'm hoping we get to see the spotlight given to the Intercontinental and Divas Championship more often on the show, as it should give the show a real purpose, giving fans a reason to tune in, whilst elevated the titles themselves.